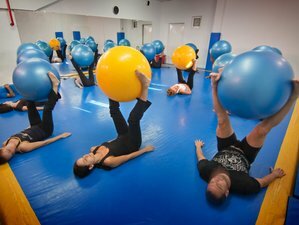 If you are looking for a fitness retreat in Spain where you can lose weight or get fit and at the same time enjoy a beautiful place, this fitness holiday is your choice. Even if you are not in good shape, all the gym sessions and outdoors activities will be adapted to your condition. The fitness / weight loss boot camp is based on a mixture of a wide range of exercises and a very healthy nutrition with no starvation. Sendero Sur Holidays' qualified trainers will give you the boost you need to achieve results that you will be delighted with! Finca Eslava is an old and completely reformed Andalusian farmhouse. The hotel has lovely gardens and courtyards in which you can relax and unwind throughout the year given the great Spanish weather. There are adult and children’s outdoor pools, which are available between June and September, as well as a 25-meter indoor pool and a luxury spa available all day, every day. Note: Sendero Sur Holidays will make sure that you will stay in a private room unless you want to. This uniquely flexible fitness holiday is ideal because it can fit your schedule. You can arrive when you can, stay as long as you like, and leave whenever you need to get back. Below is the daily schedule of the program offered by Sendero Sur Holidays. You can arrive at any time, but this holiday usually starts at lunchtime. Lunch is available from 13:00 until 15:30. After lunch, you will have time to settle in and complete the necessary paperwork. The next thing on the agenda will be the health and fitness tests which are always done between 18:00 and 20:00, Monday to Friday. Apart from that, you are free to join the day’s events (gym classes, hike or bike ride, depending on the time of year and day of the week), or you can take the time to relax and unwind or catch up with some shopping. If you arrive at the hotel so late that you miss dinner on the first night, Sendero Sur Holidays will arrange for you to stay at the hotel on a B&B basis for a charge of 65 EUR. You are very welcome to join Sendero Sur Holidays for the first activity of the following day, whatever that is, usually at no extra charge. Please note that if you arrive on a Sunday, unless you can get to the hotel and be ready to leave by 09:00, the only things on your agenda will be lunch and health and fitness checks as the trainers do not return to the hotel until late afternoon. Your holiday usually finishes at breakfast on the final day. On that day, if your flight timings allow, you are very welcome to join in with the hikes, bike rides and gym classes at no extra cost. Lunch and dinner from the special menu may be taken with your fellow guests on the final day for a small supplement of just 12 EUR per meal. Antonio is a qualified fitness/spinning instructor and sport nutrition expert, title approved by International Personal Trainers and Coaching Association. He is also a qualified mountain bike monitor which is his first passion. His love for outdoors sports has led him to hike and climb a lot of mountains, including Sierra Nevada, the Pyrenees and the Rif Mountains of North Africa. He’s been rock climbing from the age of 18 and he still enjoys it in his free time. David is native from Antequera and has spent much of his childhood exploring the local mountains. He has extensively hiked most of the mountain ranges of Andalucia and has also trekked in the Pyrenees, the Alps, the Atlas, the Rif mountains of North Africa and the Andes mountains of South America. The result of David's lifelong love of the mountains led him to study geography at the University of Granada and qualify as a sport nutrition expert and mountain guide. As well as being an expert on Geology, David has an incredible knowledge of the local flora and fauna. Leah is a fully qualified level three fitness instructor / personal trainer who specializes in group exercise classes. Her fun, motivating approach will ensure that you enjoy even the hardest of classes. From Pilates and yoga right through to body combat / pump / attack and Zumba as well as much more, her enthusiasm for fitness is apparent. Isa is native from Antequera. As a physiotherapist, she is experienced in the treatment of all types of injuries. She is also a qualified Swedish and sports massage therapist and is certified in Traditional Chinese Medicine, including acupuncture and herbal treatments. Isa is also a qualified nutritionist and she has achieved great results working with overweight clients. osé is a qualified mountain guide. José and David are brothers and they both have inherited from his father the love for nature. He has walked all the ranges around since he was a child, learning a lot about wildlife and local flora. He has hiked the Sierra Nevada mountains, the Pyrenees and the Alps. José will be the support for David and Antonio on the hikes and kayaking tours. Without a doubt, Antequera in Malaga Province is one of the loveliest places in Andalusia. It is located at the crossroads of Andalusia and it has always been a must for all travelers. Due to its strategic location, it has been called “the heart of Andalusia”. The Antequera borough, with a large area (810,39 square kilometers), is the largest of Malaga and the fifth largest in Spain. The magnificent Monument Complex is the result of a continuous history of more than 4500 years which is expressed in more than fifty buildings with religious and civil architecture dated between the Bronze Age and the 21st century. You can see dolmens, collegiate churches, churches, convents, palaces, arches, gateways, citadel, chapels, hermitages, museums, mansions, small urban palaces and even the very own urban grid. Apart from the magnificent monuments, Antequera boasts a beautiful countryside with amazing places such as the vega (fertile lowland), reservoirs, rivers, "Peña de Los Enamorados" ("Lovers’ Rock"), Mediterranean scrubland and El Torcal, a surprising and “sculptural” limestone landscape where you will feel as if you have travelled back millions of years in Earth’s history. The restaurant at Finca Eslava (four-star hotel) is Michelin-recommended and prides itself on its reputation as one of the best restaurants in the local area. They have worked with the hotel chefs to produce a menu that incorporates many local dishes which have been specially tailored to the needs of our clients. The meals provide all that you need to fuel your fitness activities, whilst being carefully prepared to support your health and weight-loss goals. Yogurts, nuts and fresh fruit are always available. Please book a flight and arrive at Málaga Airport (AGP) or Federico García Lorca Granada Airport (GRX). Transfer from and to the airports is included. Sendero Sur Holidays will pick you up from the airport. There is only a supplement for airport transfers if: your flight gets in before 8.30 a.m., your flight gets in after 9 p.m., your flight leaves before 11 a.m. If that's the case, there is an extra charge of 5 EUR for every 30 minutes (or “part thereof”). Sendero Sur Holidays will also have to charge that supplement if you arrive at the pick-up point more than 30 minutes late - unless you have sent a text message to the number in your meeting instructions by the time of your original scheduled departure. Sendero Sur Holidays has over 5 years of experience in working on fitness and weight loss boot camps and a large experience in adventure sports in Spain. This holiday is available from November 1 to April 30. Please select an arrival date below.